MidwestWeekends July 9-There’s good news for bicycle tourists looking for a new stretch of trail to try. This week, a troublesome 1½-mile stretch of the Mesabi Trail in northern Minnesota finally was completed between Taconite and Marble, giving riders 74½ nonstop miles of beautiful asphalt. 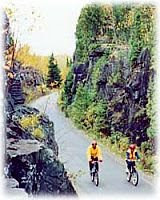 The rolling trail, which does not follow a rail corridor, takes riders past turquoise mine-pit lakes, through rock cuts and to the door of nearly every Iron Range attraction. For more, see Lodge to Lodge Biking. 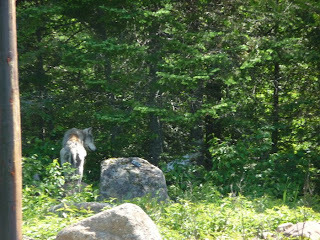 Yesterday two guest were driving along the Lima Grade just south of the North Brule River and about four miles from Poplar Creek Guesthouse B&B when they spotted this wolf along the trail. There has been a pack of five or six wolves in the area for sometime. Guest staying a the Tall Pine's Yurt often have heard them howling and several people have spotted them along the Lima Grade before. This lone wolf is likely a member of thie Lima Grade pack. After four or five of non-stop days of rain and wind gust up to 40 miles per hour, yesterday it did not rain and the wind finally stopped blowing. At Boundary Country we had one dripping wet canoe party return one day early. One of the men on the trip’s raincoat tore apart. Needless to say he was soaked. Otherwise several other of our parties are still out on their BWCA canoe trips. Today and for the next several days the forecast calls for sunny weather. This should give everyone a chance to dry-out.